Roger Stough, 89, of Webster City, died, Sunday, March 31, 219 at his home. Funeral services will be held at 10:30 a.m. on Wednesday, April 3, 2019 at Faith United Methodist Church with Pastor Peggy Ellingson officiating. Burial will be at 3:00 p.m. at East Side Cemetery in Estherville. Visitation will be held from 5:00 p.m. to 7:00 p.m. on Tuesday, April 2, 2019 at Foster Funeral and Cremation Center. 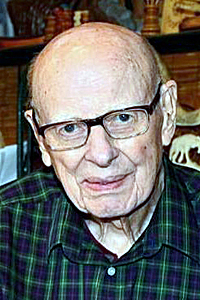 Roger Wayne Stough, son of James and Ethel Greenwood Stough, was born June 14, 1929 in Jackson, MN. He graduated from Jackson High School. He married Shirley Bechtel on October 25, 1952. She preceded him in death on August 17, 1988. On December 30, 2005 he married Joyce Arras in Webster City. Roger was a cabinet maker. He worked at Becker Manufacturing in Alta before owning and operating Estherville Millwork and then working at a commercial cabinet shop in Estherville until his retirement at 70. Roger is survived by his wife, Joyce of Webster City; daughter, Becky (Dave) Hoss of Pipestone, MN; grandchildren, Todd (Kelli) Allen, Lance (Tonya) Hoss, Travis (Naomi) Hoss, Chris (Amanda) Hoss; Savannah (Matt) Lange, Brian (Kate Hansen) Stough, Kelsey Stough; 21 great-grandchildren; daughter-in-law, Terri Stough of Austin, MN; step-children; Jerry (Marlon) Manto of Richmond, TX, Joy (Jay) Meyer of Cheyenne, WY, John (Marci) Arras of Detroit Lakes, MN; step-grandchildren, Lee (Sabrina) Manto, Jade Manto, Max Manto, Luke (Dani) Meyer, Dianne (Bryan Morris) Meyer, Adam (Tiffany) Arras, Eli Arras; brother, Art (Norma) Stough of Truman, MN; brother-in-law, Art Matasovsky of Jackson, MN; sister-in-law, Darlene Stough of Spencer and many extended family. He was preceded in death by his parents; wife, Shirley; son, Jim Stough; siblings, Clint Stough and Shirley Matasovsky. Roger was a member of Faith United Methodist Church, Boone Valley Woodcarvers and the Ames Woodturners. He enjoyed wood carving and playing cribbage but most of all, spending time with his family. In lieu of flowers, please make a donation to your favorite charity in memory of Roger.